This page provides help and examples of how to search for pesticides you can use in your garden. What pesticides can I use on a particular plant or area in my garden? Can I still use the old pesticide in my shed? What pesticides are available to control a particular pest/disease in my garden? This search will only give results for pesticides which can be used in a garden/ allotment or on houseplants. For a full range of products including those for agricultural uses you must use the Pesticides Register database. Where you wish to apply the pesticide. Click on the picklist to see possible entries. Examples of the searches you can perform are given in the section Some Common Queries below. The trade name as given on the product container. Click on the picklist to see possible entries. The product registration number which shows the product has been authorised by the Chemicals Regulation Division (CRD). In the past these were given as ‘MAFF numbers’. The company that markets the product. It may also be the name of the shop that sells the product. Click on the picklist to see possible entries. Sometimes called ‘active substance’ or ‘active’ - the chemical that makes the pesticide work. Click on the picklist to see possible entries. How the pesticide works. Click on the drop down arrow to see possible entries. These include ‘insecticide’ (a pesticide used to control unwanted insects), ‘fungicide’ (a pesticide used to control unwanted fungal diseases in plants) or 'herbicide' (controls unwanted vegetation) – weed killer. This gives the number of results which will be listed on each page when you select ‘Get Results’. If you make a mistake this will clear the screen so you can start again. Once you have filled in at least one box, this will give you a list of all pesticide products that match. This will retrieve this Help page. Which pesticides can I use on a particular plant or area in my garden? Use the scroll arrow to move up and down the list. Click to select the entry that describes the plant/area which has the pest/disease. The entry should now be highlighted in blue. Click on 'Select' and then 'Get Results'. In order to get a complete list of all possible pesticides you may use you may need to do more than one search. For example, for use on cabbage (a plant you can eat) you should search using the plant group ‘All edible crops’ and search again selecting ‘Cabbage’. For example, for roses (a plant you can’t eat) you should search using each of the following plant groups; ‘All non edible crops’, ‘ornamental garden plants’ and ‘ornamental plant production’. For example, for products which can be used on a garden path you should search using each of the following plant groups/areas; ‘Areas not intended to bear vegetation’, ‘hard surfaces’ and ‘unwanted vegetation’. A search using the term ‘All situations’ will give you a list of products for use as slug/snail killers, weed killers, animal repellents, insecticides and fungicides. Locate a number on the label with the letters ‘MAFF’ or ‘MAPP’ at the beginning. Type in the numbers (only) in the ‘MAPP No.’ box. There should always be 5 digits, for example 07777, not just 7777. If there is only a number which begins with ‘HSE’ the product was registered with the part of CRD for which information is currently held on the main HSE website (The two website areas for the Chemicals Regulation Division (CRD) have not yet been merged). Which pesticides are available to control a particular pest/disease in my garden? At CRD we cannot give advice on which pesticides control which pest/disease. You must ask for this information when you are buying your pesticide or check on the label of the pesticide container. 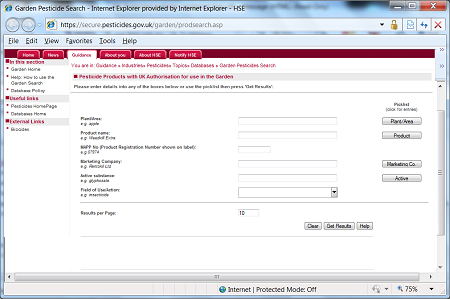 Our database will let you search for the purpose of the pesticide eg insecticide. Herbicide – controls unwanted vegetation (weed killer). This should now be displayed in the Field of Use/Action box. This means that there are no pesticide products matching your query which you can legally use. However you might try repeating your search. Make sure you use the picklists available and if you typed in a MAPP No. ensure it has 5 digits. For further help and advice contact us. If a product which you bought some time ago does not appear on the list, it is no longer authorised for use or storage. You can contact your local council for details of how to dispose of it safely. This gives you a list of all the pesticide products that match your search and which you can legally use (as long as you follow label instructions). Expiry dates show the last date on which a you can use a product. If you click on the product name you will get more details of the product's authorisation.